The first thing that struck me about Rwanda when I arrived was the remarkable cleanliness of the city streets in Kigali. I found the locals to be extremely welcoming and kind, polite, soft-spoken and with what felt like a deep sense of cultural pride. This impressed me very much. Making our way out of the city, I found the country itself to be absolutely breathtaking. 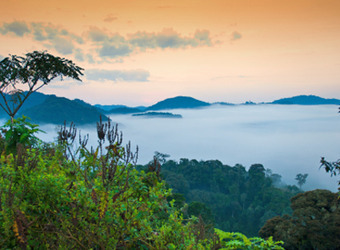 Picture a series of dramatic volcano peaks, lush and green and often shrouded in mist, set against the deep, rich blue of the sky...and the excitement of the knowledge that you're about to trek into those jungles in search of mountain gorillas. Seeing gorillas in their natural habitat was one of the most magical wildlife encounters I've ever experienced. On our second trek, we encountered a family of gorillas enjoying their social hour; it was quite a thrill to watch them tumble through the forest, climbing, playing and interacting with one another, seemingly unaffected by the awed presence of our little band of humans. The 2 treks we did were of varying length and difficulty, but we felt we were in good hands the entire time with our guides, trackers and porters. As we made our way back to the lodge for the night, we passed small, bustling villages and colorful, terraced hillside farms, enjoying the sight of families commuting together by bicycle. The country surprised me with its richness and beauty, but the warmth of the people and the peaceful rhythms of life in the country very much won me over. I wrote a review on iSafari.com and thought you might be interested!